WASHINGTON (AP) — Acting Defense Secretary Patrick Shanahan has been to Europe, Iraq, Afghanistan and the Mexican border as part of his bid to land the job permanently. Acting White House chief of staff Mick Mulvaney was one of just two top advisers to join President Donald Trump for dinner with North Korea’s Kim Jong Un. As acting environmental chief, Andrew Wheeler spent months advancing proposals to ease emission limits for power plants, cars, and oil and gas facilities before Trump nominated him to lead the agency for the long term. 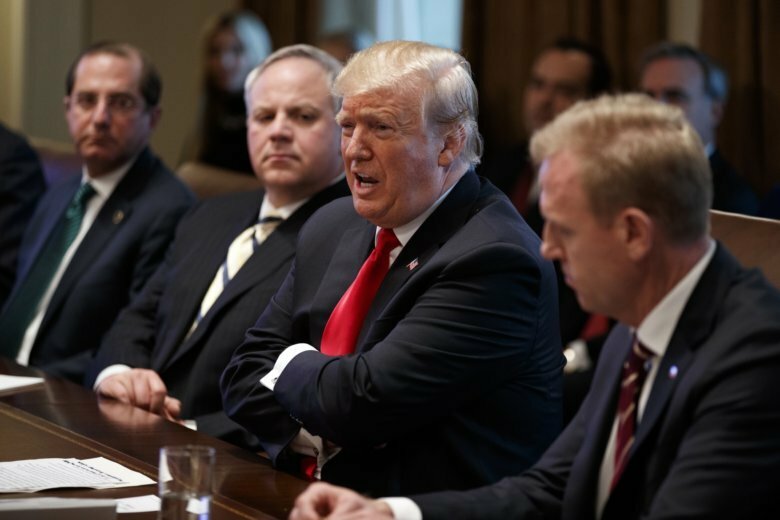 Trump opened his third year in office with a Cabinet that included an outsize number of secretaries and other advisers with “acting” in front of their titles, including the attorney general. Trump doesn’t seem to mind, and the temporary job status has not kept these officials from diving into their jobs, representing the United States around the world and conducting business alongside the president. But good-government experts and others say it’s important to install permanent people in top jobs to maintain stability. “Actings are not long-termers,” said Paul Light, a federal government expert. Trump has had an acting defense secretary, chief of staff, budget director and ambassador to the United Nations since the beginning of the year. The Senate last week confirmed Wheeler to lead the Environmental Protection Agency after he spent seven months in an interim role, and Trump has nominated acting Interior Secretary David Bernhardt to head that department, where he’s been serving in an interim role since December. William Barr is the new attorney general, after the post was filled for three months by Matthew Whitaker in an acting capacity. Trump says placeholder officials give him more “flexibility.” But flexibility for what? Neither Trump nor the White House has fully explained. Max Stier, president and CEO of the Partnership for Public Service, which advocates for more efficiency in government, said having too many acting leaders creates “unbelievable uncertainty.” Stier said people seek government employment not just to serve the president but to work for specific leaders. “People coming in might not know who their boss will be,” he said. Turnover at the top can also make it harder to fill second- and third-string jobs. Trump is also known to quickly turn on aides he once praised, which has contributed to high levels of turnover inside the White House and throughout the government. Two years into his four-year term, Trump is already on his third national security adviser and third White House chief of staff. Several Cabinet secretary slots, including at the State, Health and Human Services and Veterans Affairs departments, also turned over in Trump’s first two years. And it isn’t just the top jobs Trump has had difficulty filling. Some second- and third-tier jobs are also vacant, including the deputy secretary positions at the Homeland Security and Housing and Urban Development departments. Trump has left scores of other positions throughout government unfilled in favor of a leaner bureaucracy. He has signaled that he is in no rush to replace his “acting” secretaries, perhaps viewing them as more inclined to support him, especially if they hope to land the jobs permanently. Light, a professor at New York University’s school of public service, said the law limits the amount of time an “acting” official can serve to about seven months. He said it gives presidents flexibility to get someone into a job quickly and also replace that official quickly with a Senate-confirmed candidate, rather than hold jobs open for indefinite periods of time. Light added that “actings” often aren’t viewed as having the same level of authority as a Cabinet secretary who has been approved by the Senate. Shanahan, who was the deputy defense secretary, has had the “acting” job since Jan. 1. It remains unclear whether Trump will nominate Shanahan to succeed Jim Mattis, who resigned over policy disagreements with Trump, or ultimately pick another candidate. That leaves the Pentagon with an acting secretary for just the third time in its history, and for the first time since 1989. Trump has publicly praised Shanahan, who used a recent Oval Office appearance to return the compliment. As Trump prepared to sign papers directing the Pentagon to create a new military branch dedicated to space, a Trump idea that Shanahan supports, the president yielded the floor to Shanahan. “This is a historic moment,” he told Trump.